This delicious, thirst-quenching, my son gets in his veggies, drink, was provided to me free of charge for review purposes…. We just tried these delicious tasting juices, V8 V-Fusion® Refreshers, and they are so aptly named because they could not be more refreshing. I generally don’t buy a lot of juices. My son drinks lots of water and a serving or two of milk every day. However, my sweet son will not eat a vegetable unless it is a potato shaped like a rectangle (or however you describe the shape of a french fry) and fried. Hey, I love a good french fry, too, but I also love all vegetables. To my son’s credit, he does love most all fruits, I on the other hand, don’t usually get my daily recommended serving of fruits. This is why I’m loving the V8 V-Fusion® Refreshers… my son can get in the benefits of eating veggies and I can get my fruits into my diet. Win-win. Plus, they are so tasty. Made with both fruit and vegetable juices, V8 V-Fusion® Refreshers are naturally sweetened, contain no artificial colors, flavors or preservatives and are an excellent source of Vitamin C.
I can’t be the only mom with a child that won’t eat their vegetables? Really? 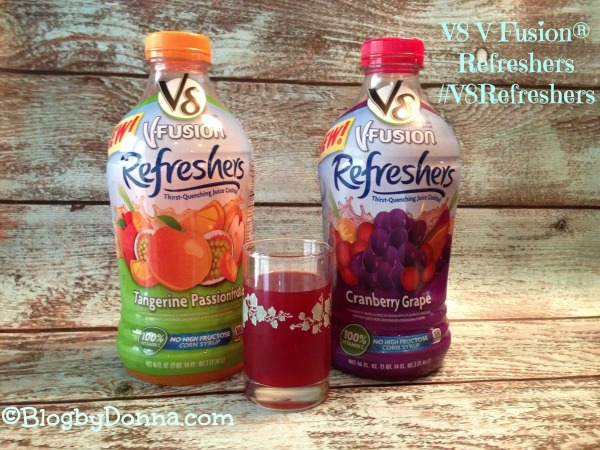 We tried the V8 V-Fusion® Refreshers Cranberry Grape (my favorite) and the V8 V-Fusion® Refreshers Tangerine Passionfruit (my husband’s and son’s favorite). And at 100 calories a serving, they don’t wreck my calorie count for the day. Gotta love that! The V8 V-Fusion® Refreshers also come in Black Cherry Berry (I can’t wait to try it) and Peach Strawberry and can be found at your local grocery stores for approximately $3.49 for a 46 oz. bottle. Disclosure: I was provided the above product(s) for review purposes. All opinions are 100% mine and may differ from yours. I will only endorse companies, products, and services that I believe, based on my own experiences, are worthy of endorsement. Thanks for this post. I think I will give it a try. I need to try these. My kids don’t get enough of their veggies! I love the V8 Splash line so I am betting I would love these as well. Thanks I have to look for these next time I am out shopping! I love plain old V-8 juice. I would most likely try the cran-grape. I’ve been wondering how these taste. My husband drinks v8 Fusion Strawberry Banana every morning. I have one child that will eat any veggie under the sun and one child that won’t touch anything but carrots…. it’s MADDENING! I haven’t tired the Fusion Refreshers… wonder if that is the magic key? I’d like to try Black Cherry Berry. These are so good, we love ’em! My kids used to hate their veggies especially the boys and some of the little ones, but, since rowing our own they have actually stopped grumping! I never use to like V-8 juice mainly because it was tomato juice and I’m not a fan of tomatoes but the V8 V-Fusion are delicious! I would want to try the Cranberry Grape. I love V8 drinks! I’ve been meaning to buy some of these but I always forget (old age, here). I’m adding them to my list now so that I won’t forget. I am not a V8 drinker but I do love their refreshers! Yum! I love V-8 but haven’t tried the refreshers, those sound great! My kids are big fans of the regular V8 Fusion juices, so I have a feeling they would really enjoy the new Refreshers as well. I want to try the Black Cherry Berry flavor. These drinks look so delicious and I need to get me some. The Smoothies are so good too. Especially the v8 Mango smoothies. We haven’t tried the Refeshers yet, but I buy her Fusion all the time. The V8 V-Fusion are delicious. It’s the only way I’ll drink V8. I haven’t tried these yet but I loveee the V8 Splash! Love this stuff! We buy this for my nephew to get him to get his fruits and veggies too. My boys actually love these, and it is one of the only ways I can get my youngest to eat vegetables. Those refreshers look good! I actually just clipped a coupon for them a week or two ago, and I plan on trying them! I love the V8 Fusion Refreshers myself! I’ve tried V-8 Splash but not the Refreshers. Looks really good! I don’t usually buy a lot of juices either. They are only for special occasions in our household. This does sound good! I’d love to try black cherry berry. My daughter actually introduced me to V-8 Fusion juices and now we always have it in the fridge! Its so delicious and good for you to! I buy the V-8 energy drinks in the small cans. Not much energy but still tastes as good as the refreshers and fusion.